I have successfully setup Emby Theater on my HTPC to work with Harmony Elite and both the Harmony and Alexa Skills. 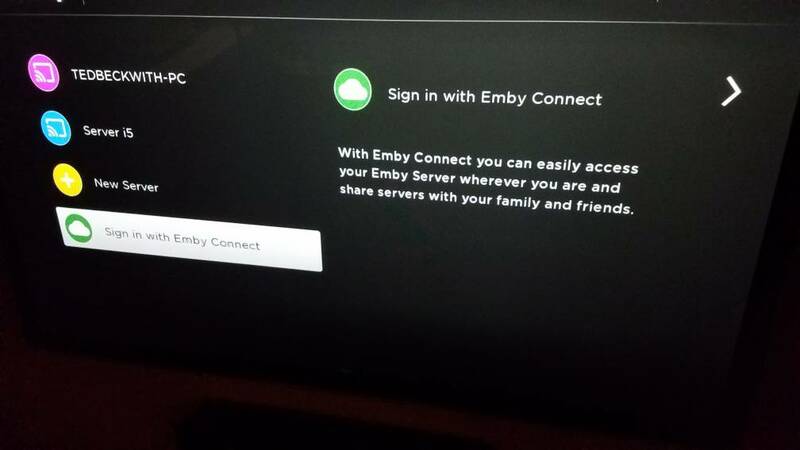 In order to do this I had to change my setup a little bit, creating login credentials for my main User and connecting ET through Emby Connect instead of directly as before. This is not necessarily a bad thing as now this user has more security. The issue is that I've only been able to get one of my Rokus connected to this user account through Emby Connect (Fortunately the one in the master bedroom). I have 5 other Rokus and when I try to login to Emby Connect, selecting the same user account and Password, as well as the correct server I only get a spinner. This lasts for several minutes before I give up and move on to something else. Do I need to wait longer? Is there a limit to the number of devices connected to the same user account via Emby Connect or on Rokus? Am I doing something else wrong? Attached is my server log created a minute ago but I was trying to do this about 1½ to 2 hours ago. 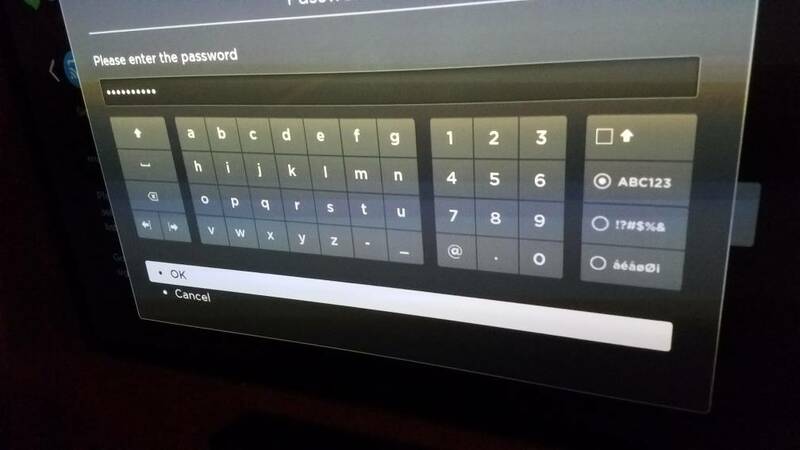 With Emby Connect there isnt' a password to enter on the Roku, you instead use the pin code sign in process. Try that. So I should probably just connect manually instead of using Emby Connect..
Second, If I connect manually, do I use the password for this account and not the PIN? Third, Is there a Wiki on logging into Roku using the PIN? Lastly, I take one ore two Rokus with me on vacation and hook them up to Hotel TV's via HDMI typically. If I connect to this account manually will it work when on the WAN or will I then need to use Emby Connect? There might not be a wiki on that but there's really not much to it. 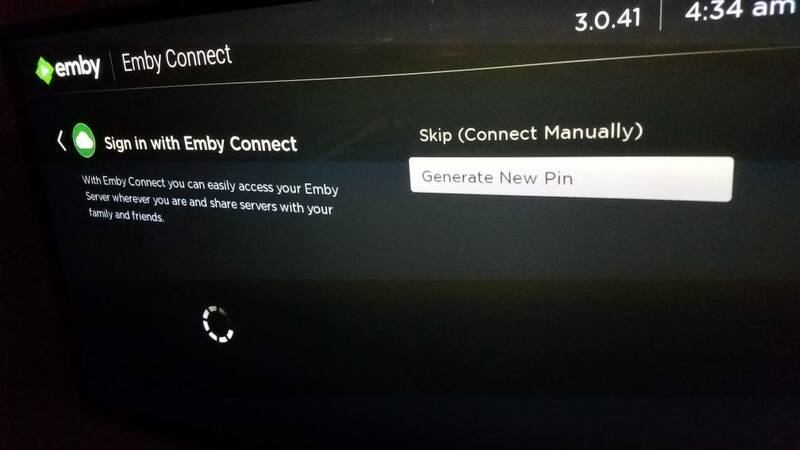 you just select sign in with emby connect during the initial sign in process and it will walk you through it. When I do that it presents me with a login screen. I enter the password for the user account TVTime and it spins and spins.. Nowhere is it prompting me for a PIN. 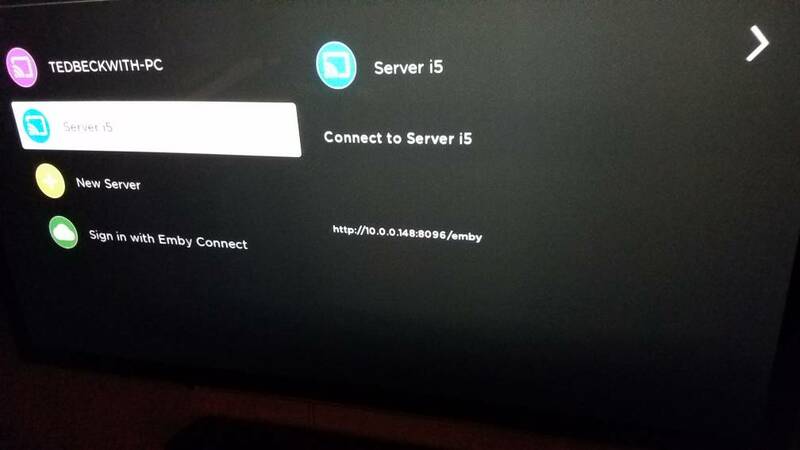 I guess I'll try again or just direct connect but will Emby for Roku find the server when out of network this way? When you do what exactly? 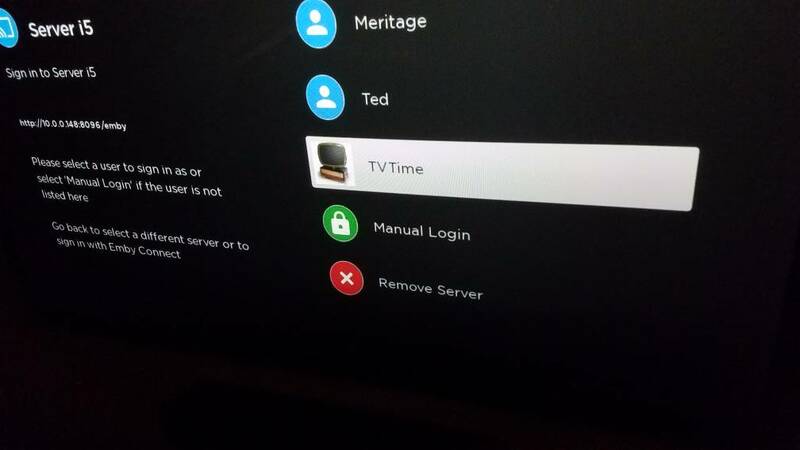 When I try to log into Emby Connect on Roku it doesn't present me with a PIN option but rather a place to enter a password. I enter the password and it spins and spins. I'm wondering if I need to somehow sign out completely and sign in again. I changed this account to an Emby Connect Account this week and assigned an Emby Connect Password to it so maybe Roku is confused. Maybe I need to remove the Emby Channel from these Rokus and start from scratch? 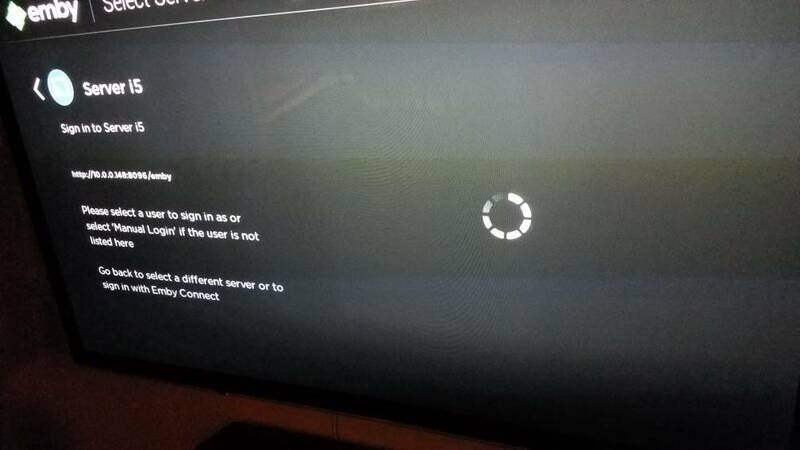 Are you able to provide a screenshot of where this screen is asking for a password? I will when I get back to trying to set these up tomorrow but first I'm going to just connect directly rather than through Emby Connect and see if that works. Hit an miss on connecting at hotels. Usually it is a hit. Sometimes I have to use my Travel Router to connect and have my own private network. I think the hotel's router only sees it and not other devices but I'm not sure. There have been rare times where I cannot get it to work at all and that's not a big deal. can you provide a little more information? where did you enter it? What exactly happened? Thanks. I have been busy installing more security cams and haven't got back to this other than to state that I have three Rokus logged into the same User account (TVTime) by choosing to connect to the server the user resides on then selecting the user then leaving the P/W blank. I haven't tried two Rokus as of yet but there's one that just gives me a spinner that won't stop. I'm confused. Is there a limit to the number of Rokus that can be connected to the same account? I will post pictures and can grab a log when trying yet again. I will most definitely post this tomorrow after I get the chance to check it out.. Finally getting back to this. Here's some screen shots. No PIN generated, just a spinner. Posting from my phone. This photo actually proceeds the one above. Direct sign in to server. I tried both with and without the password. Edited by Sammy, 11 October 2017 - 08:00 AM. Okay, the first issue must mean that your Roku cannot get out to our server to get the PIN. Check any firewall or router settings that would be blocking access to connect.emby.media and mb3admin.com. The second one I'm not sure about because it appears the password was correct. I see you are still on 3.0.41 though and a new release just went out so try upgrading just to see if that helps with the manual login. Would three Rokus connect without issue but another not connect? I don't have any open ports or firewall connections set up for Roku at all. Also, not sure why this particular unit would not be connecting to mb3admin.com and the others are connecting although I have several Rokus. Two connected right away, the other just connected one day randomly and I don't know why. All of these connected the same why I tried this unit, BTW. I still have two more to get connected too. I just removed all references to the TV Series folder on that network drive but will re-enable it after clearing up some space then enable it again. That drive is close to capacity but not that close.